This guide will show you how to use the PicketLink Identity Management API to design and implement your own identity model accordingly with your requirements. PicketLink IDM provides a very extensible Identity Model from which you can build your own representation of security-related entities such as users, roles, groups, devices, applications, partitions, relationships between them and so forth. It also provides a default implementation to support some very common security concepts, the Basic Model. The Basic Model can be used for most applications, covering some basic security requirements and representations for users, roles, groups, grant roles to users or turn them as members of different groups. All code for this guide is available from the Custom Identity Model Quickstart. Please, check it out for a full working example. Before enabling security into your application you should ask yourself about what it needs in order to represent all entities involved with your security requirements. Let's say that some of these requirements are password-based authentication and RBAC (Role-based Access Control), pretty common in most applications. You would probably need something to represent users, roles and password-based credentials. And this is exactly what an Identity Model is, a representation of entities required by your application in order to support its security requirements. Support multiple security domains or realms, where each realm defines a set of security policies such as a key pair, HTTP/SSL enforcement, maximum number of failed login attempts. A security domain may have one or multiple applications. They inherit all policies defined by the security domain they belong. A security domain may have one or multiple users. Where each user is allowed to access a set of applications from a specific security domain. A security domain may have one or more roles. They are visible by all applications for a specific realm, also called global roles. A security domain may have one or more groups. They are visible by all applications for a specific realm, also called global groups. An application may have one or more roles. They are not shared by other applications. An application may have one or more groups. They are not shared by other applications. Users and groups are granted with roles. When granted to a group, all its members inherit the roles granted to the group. Applications are accessible only from authorized users. If a group is authorized, all its members are allowed to access an application. Please, take a look at the documentation for more details about each one. In PicketLink, IdentityType instances are associated with a single partition. A partition defines a scope for identity types, providing a logical separation between them. Types stored in a partition are only accessible from it. For instance, users belong to a realm and are accessible by all its applications. But users from a realm are not accessible to other realms. The same applies for roles, where roles defined by a realm are accessible to all applications, representing "global" roles. Applications can also have their own roles and groups. Roles and groups can not be shared between applications. For this reason, we also need to consider them as partitions as well. Please, take a look at Partition Management for more information. Let's start by defining the Realm partition. The AbstractPartition provides a default implementation for the Partition interface, from which all partition types should implement directly or indirectly. Basically, what this interface defines is a getter to obtain the partition name. All partitions must have a unique name. When creating a partition type, you must also specify which types are supported and can be stored on it. The @IdentityPartition annotation tells PicketLink which types are supported by a partition. In this case, we're saying that only Application, User, Role and Group types can be stores in a Realm. If you try to add some other type, PicketLink will not allow. Partition properties are annotated with @AttributeProperty. This annotation tells to PicketLink that a property must be stored and that it represents some state for a specific type. For Realm, we're storing a key pair and the maximum number of failed login attempts. The code above creates a new Realm, populates it with some data, stores it and retrieves it from IDM. If you're not familiar with PicketLink Identity Management API, please take a look at Identity Management Overview guide. The same steps can be followed to create the Application partition, with a little difference. We now implement the Partition interface directly. You may notice that Application is extending AbstractIdentityType. The reason for that is that an application can also be used in relationships in order to authorize access from users. And for that it must be also an IdentityType. We'll cover identity types in the next sections. // applications have two distinct representations: identity type and partition. They mean different things. The code above is an example about how applications must be managed. First, we store the Application as an IdentityType using the IdentityManager. This makes the application accessible only from a specific partition, in this case Acme. Right after, we create a new partition to represent the application and to store its own roles and groups. In PicketLink, an IdentityType is used to represent any security-related entity such as roles, groups, devices, applications, organization units and so forth. In a nutshell, identity types must implement the IdentityType interface. To make life easier, PicketLink also provides AbstractIdentityType, which is a base class with a default implementation. Identity types are always associated with a partition and can not be accessed from other partitions. They can also participate in relationships to associate an user or group with a role or add an user as a member of a group. Please, take a look at Custom Identity Model for more information. * A query parameter used to query roles by name. * A query parameter used to query groups by name. * A query parameter used to query groups by parent. As mentioned before, identity types must implement IdentityType. Both Role and Group are extending AbstractIdentityType, which is a base class for custom identity types. You may also notice the usage of @AttributeProperty. This annotation tells to PicketLink that a property must be stored and that it represents some state for a specific type. Some identity types are very common between different use cases and requirements, like roles, groups and users. In PicketLink, those common concepts are represented as Stereotypes. Both Role and Group types are annotated with the IdentityStereotype. This annotation tells to PicketLink which stereotype is related with a specific type. This is a very important configuration if you want to integrate your custom types with some built-in features provided by PicketLink, like authorization. Some identity types represents a hierarchy. For instance, groups usually have a parent-child relationship between them. PicketLink allows you to represent hierarchies by just having a property with the same type where it is declared. This is the only thing you need to start querying instances based on any property annotated with @AttributeProperty. // stores the global role. In PicketLink, an Account is a special type of IdentityType that is capable of authenticating. Since the authentication process may not depend on one particular type of attribute (not all authentication is performed with a username and password) there are no hard-coded property accessors defined by this interface. It is up to each application to define the Account implementations required according to the application's requirements. Create an Account require the same steps as in IdentityType. The main difference is that you must also implement the Account interface. Just like Role and Group you should also define a stereotype to your user types. PicketLink provides a number of features based on the concept of "users", using his name to authenticate, authorize and recognize your own user representation. An Account can use any of the built-in credentials provided by PicketLink such as username/password and One-Time Passwords. Considering our requirements, users should be capable to authenticate using an username/password credential. In PicketLink, relationships are represented by the Relationship interface. Like Partition and IdentityType, relationships must implement a specific interface as well. The same thing regarding stereotypes. PicketLink also provides a set of common relationships which can be defined to your custom relationships such as grant roles to users and groups or tell an user is member of a group. All relationship types are implementing the Relationship. You may also notice the use of AbstractAttributedType. In PicketLink, every single type is a child of AttributedType. Including partitions, identity and account types. This base class is just a handy way to get a default implementation for some methods required by the Relationship interface. Some relationships are very common to most use cases and PicketLink also provides some stereotypes to represent them. This is the case for the Grant and GroupMembership. Relationships stereotypes are defined using the @RelationshipStereotype. For the same reason as identity types, relationship stereotypes are important to reuse some built-in features provided by PicketLink. For instance, the security annotations used to check access based on the user roles. The ApplicationAccess type does not have a corresponding stereotype, so we don't need to define one. It is a project-specific relationship required to satisfy our requirements. You may also notice the use of @InheritsPrivileges in ApplicationAccess. This is a very important configuration to check access for users considering the group they belong. The assignee of this relationship is a generic IdentityType, which means it can be an User or a Group. When the assignee is a group, all its members are also allowed to access the application. Relationships can declare formal attributes to define any specific state. For instance, in ApplicationAccess we are defining some additional properties to store the number of failed login attempts and the date of the last success and unsuccessful login of an user in an application. You may notice from the examples the usage of RelationshipManager. This component is obtained from a PartitionManager and provides a set of management operations for relationships. Please take a look at the Identity Management Overview for more details. Relationships are also queryable. PicketLink provides a simple Query API for relationships. When defining your relationship types you can also specify query parameters just like we did with identity types. Considering the requirements, we are now able to query all roles, groups and applications for an user. Or even retrieve which users are allowed to access a specific application. As you might know, PicketLink IDM has a Configuration API from where you provide all the necessary configuration to your application. Please, take a look at the documentation if you're not familiar with it. When you provide your own custom identity model, you must specify each type in the configuration. This is a very simple configuration if you want to start developing and testing your custom model. You don't need anything else, but a filesystem. Once you are done, you can always switch to a different identity store (eg. : JPA) and your code will still be the same. 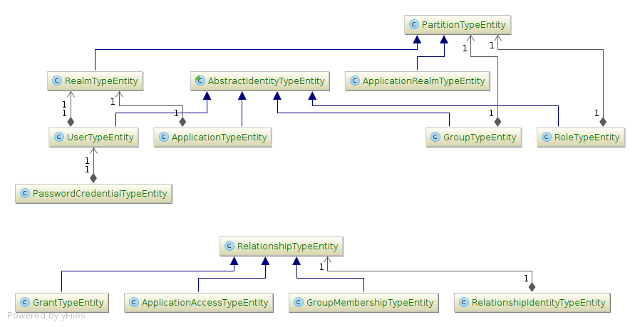 In the next section we'll see how to create a JPA Entity Model to map all those types from the custom identity model. PicketLink IDM allows you to store your identity model in a database. For that, it provides a JPA Identity Store and a set of mapping annotations to be used in your JPA @Entity types. When designing your entity model, you must consider how your identity types are defined and what you need to store for each one. The decision to store them in a single table or use multiple tables is up to you. PicketLink does not force you to follow a specific design. You can even have reference to entities from an existing schema. Considering the custom identity model, we can use the following entities to map it. @IdentityManager - Used to specify the type being persisted by an entity. @Identifier - Used to mark a property of an entity as an identifier. In PicketLink, all types have a string valued identifier. @AttributeValue - Used to mark a property of an entity as related with a specific property of the type being mapped. If a property has different names in the entity and type, you can specify the type's property name. PicketLink also provides more annotations, some of them specific to the type being mapped. For instance, IdentityClass, RelationshipClass and Partition. Which you'll see shortly. Let's start with creating the mapping for Partition types. According with the diagram, three entities are being used to map partitions: PartitionTypeEntity, ApplicationRealmTypeEntity and RealmTypeEntity. Regardless the type being mapped, the @IdentityManaged annotation plays an important role. It tells to PicketLink which type is related with a specific JPA entity. In all cases above, we're using it to tell to PicketLink that each entity persists a specific partition type. For instance, if you take the RealmTypeEntity you'll see that @IdentityManaged(Realm.class) is indicating that the entity is persisting Realm instances. The @AttributeValue annotation provides a simple way to indicate that a specific property of a type must be stored by a property of an entity. In all cases above, you may notice that both type and entity have the same property names. And this is how PicketLink will set values from one to another when storing or retrieving instances from the underlying storage. Specifically considering our entity model, both ApplicationRealmTypeEntity and RealmTypeEntity are extending PartitionTypeEntity. You can say: "Why not map both partitions using a single entity?". Well, you can do that. PicketLink does not force your design decisions. But for this guide, this is probably the best way to showcase all features. Given that we have two entities representing partitions, we need to be able to create references for both when mapping other types. Remember, some of them may be stored in both Realm or ApplicationRealm partitions such as roles and groups. And that is the main motivation for the existence of the PartitionTypeEntity base entity. You'll understand that better once we start mapping identity types. For last, when mapping partitions you'll need some additional annotations. PartitionClass - Used to store the full qualified name of a partition type. PicketLink needs this to umarshall entities from the database. ConfigurationName - Used to store the configuration name used to store a specific partition. Pretty useful in multi-tenancy designs, where you may want to store instances using different identity stores. For instance, realms in database A and applications in database B. Or a separated database for each application. When mapping an IdentityType you'll need some additional annotations. @IdentityClass - Used to store the full qualified name of an identity type. PicketLink needs this to umarshall entities from the database. @OwnerReference - Used to mark, usually a @ManyToOne or @OneToOne association, as a reference to an owner or parent entity. The owner is usually another entity which maps a specific type. For identity types, it can be a reference to a partition entity or an @OneToOne entity. Let's take a look now how our entities are mapping the identity types from our identity model. The AbstractIdentityTypeEntity is just a @MappedSuperClass providing some common methods for all identity type entities. As you can see, it defines a few properties, each one is related with the properties defined by the IdentityType interface. You may also notice the use of IdentityClass. You need it in order to tell to PicketLink which type should be used when unmarshalling instances from the database. You may also notice that both ApplicationTypeEntity and UserTypeEntity are restricting the owner reference. In this case, both types can only be associated with Realm partitions, so we just use the RealmTypeEntity directly. Both IdentityType and Account types are mapped in the same way. The UserTypeEntity provides a similar mapping as the others entities. When mapping a Relationship you'll need some additional annotations. @RelationshipClass - Used to store the full qualified name of a relationship type. PicketLink needs this to umarshall entities from the database. @RelationshipDescriptor - This annotation must be used to indicate the field to store the name of the relationship role of a member. @RelationshipMember - The reference to a IdentityType mapped entity. This annotation is used to identify the property that holds a reference to the identity type that belongs to this relationship with a specific descriptor. Usually this annotation is used in conjunction with a @ManyToOne property referencing the entity used to store identity types. @OwnerReference - Used to mark, usually a @ManyToOne or @OneToOne association, as a reference to an owner or parent entity. The owner is usually another entity which maps a specific type. For relationship types, it should be a reference to an entity mapping the relationship. Let's take a look now how our entities are mapping the relationship types from our identity model. 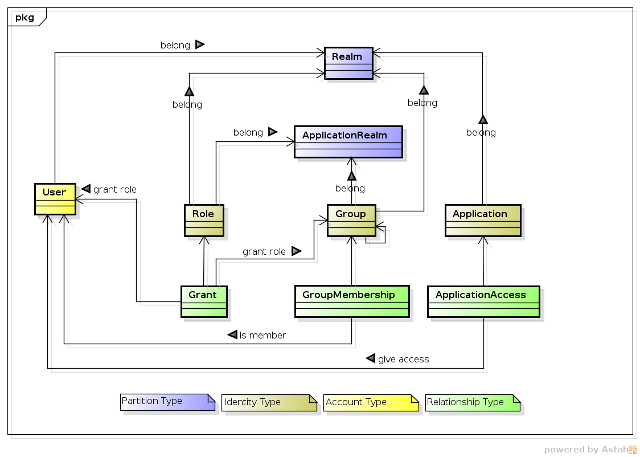 The relationships are being mapped by the GrantTypeEntity, GroupMembershipTypeEntity and ApplicationAccessypeEntity entities. These entities define the the actual Relationship type that is stored by each one of them as you can see from the @IdentityManaged annotation. When mapping relationships you must provide at least two entities. One to store the relationship and another with a reference for each participating IdentityType. For instance, the Grant relationship is an association between an User and Role. The second entity is just about that, store references for each of these identity types. This is exactly for what the RelationshipIdentityTypeEntity is about. The @RelationshipDescriptor is always used in a string field, indicating the name of the property in a relationship that is related with a specific identity type. For instance, in Grant, we have the role property to indicate the role being granted. The name "role" will be stored in the descriptor field. Basically, PicketLink needs this information to know where an identity type should be setted when unmarshalling a relationship from the database. The RelationshipMember is defined to a property that can be either a simple string @Column field or a ManyToOne field with the reference to the entity mapping identity types. In our case, we need it defined as string because we're supporting a multi-partition relationship. That means, that relationships can reference types from different partitions. If you're working with a single partition, you can define the type of the field as a direct reference to an identity type mapping. If you want an example, here is one from the Basic Model provided by PicketLink. One more reason why we need a custom identity model and not the Basic Model. You can even provide multiple RelationshipIdentityTypeEntity to each relationship type if you want to store the participants into separate tables. Just create an entity like this one where the @OwnerReference is a reference to a specific relationship entity, for example GrantTypeEntity. In this case, you must also specify the Grant relationship in the @IdentityManaged annotation. The @OwnerReference must also be annotated to entities mapping the participants in a relationship. It is just a reference to the entity mapping the relationship itself. In this case, we're defining a reference to the RelationshipTypeEntity which is the base entity for all relationship entities. In PicketLink credentials are stored by a specific CredentialStorage. Please, take a look at the documentation for more details. PicketLink also provides a built-in credential storage for password-based credentials, the EncodedPasswordStorage. Given that, we need to create a credential stoge every time we need password authentication, we just need to provide an entity that knows how to store the build-in storage. Just like we did so far, we need now to provide an entity that knows how to store each of these properties. When mapping a CredentialStorage you'll need some additional annotations. @ManagedCredential - This annotation is applied to an entity class to indicate that it contains managed credential-related state. Basically, it defines which credential storage class is managed by declaring entity. @OwnerReference - The owner of the credential. The field annotated with this annotation must be a reference to another entity wich is mapping an Account type. @CredentialClass - Used to store the full qualified name of a credential storage. PicketLink needs this to umarshall entities from the database. @CredentialProperty - Specifies that a property should be mapped to a specific field of a CredentialStorage. It behaves just like AttributeValue. @EffectiveDate - Used to mark a Date with the CredentialStorage.effectiveDate property. @ExpiryDate - Used to mark a Date with the CredentialStorage.expiryDate property. Hopefully this guide helped you to understand some core concepts of PicketLink regarding how to extend it and provide your own identity model.